Paleolithic religion is the set of spiritual beliefs thought to have appeared during the Paleolithic time period. Religious behaviour is thought to have emerged by the Upper Paleolithic, before 30,000 years ago at the latest, but behavioral patterns such as burial rites that one might characterize as religious — or as ancestral to religious behaviour — reach back into the Middle Paleolithic, as early as 300,000 years ago, coinciding with the first appearance of Homo neanderthalensis and Homo sapiens. Religious behaviour may combine (for example) ritual, spirituality, mythology and magical thinking or animism — aspects that may have had separate histories of development during the Middle Paleolithic before combining into "religion proper" of behavioral modernity. There are suggestions for the first appearance of religious or spiritual experience in the Lower Paleolithic (significantly earlier than 300,000 years ago, pre-Homo sapiens), but these remain controversial and have limited support. The Middle Paleolithic spans the period from 300,000 to 50,000 years ago. Some of the earliest significant evidence of religious practices dates from this period. Intentional burial, particularly with grave goods may be one of the earliest detectable forms of religious practice since, as Philip Lieberman suggests, it may signify a "concern for the dead that transcends daily life." Though disputed, evidence suggests that the Neanderthals were the first humans to intentionally bury the dead, doing so in shallow graves along with stone tools and animal bones. Exemplary sites include Shanidar in Iraq, Kebara Cave in Israel and Krapina in Croatia. Some scholars, however argue that these bodies may have been disposed of for secular reasons. Cut marks on Neanderthal bones from various sites such as Combe-Grenal and Abri Moula in France may imply that the Neanderthals may have practiced excarnation. Likewise a number of archeologists propose that Middle Paleolithic societies — such as that of the Neanderthals — may also have practiced the earliest form of totemism or animal worship in addition to their (presumably religious) burial of the dead. Emil Bächler in particular suggests (based on archeological evidence from Middle Paleolithic caves) that a widespread Neanderthal bear-cult existed (Wunn, 2000, p. 434-435). Animal cults in the following Upper Paleolithic period — such as the bear cult — may have had their origins in these hypothetical Middle Paleolithic animal cults. Animal worship during the Upper Paleolithic intertwined with hunting rites. For instance archeological evidence from art and bear remains reveals that the bear cult apparently had involved a type of sacrificial bear ceremonialism in which a bear was shot with arrows and then was finished off by a shot in the lungs and ritualistically buried near a clay bear statue covered by a bear fur — with the skull and the body of the bear buried separately. The anatomically modern human (as opposed to the Neanderthals) inhabitants of the Near East during that time, may have invented this form of ritualized burial practice. Middle stone age sites in Africa dating to around the same time-frame also show an increased use of red ochre, a pigment thought to have symbolic value. Religious behaviour is one of the hallmarks of behavioral modernity, generally assumed to have emerged around 50,000 years ago, marking the transition from the middle to the Upper Paleolithic. Evidence of burial with grave goods and the appearance of anthropomorphic images and cave paintings may suggest that humans in the Upper Paleolithic had begun to believe in supernatural beings. The cave paintings of Chauvet have been dated to 32,000 and those at Lascaux to 17,000 years ago. At Lascaux the anthropomorphic paintings show depictions of strange beasts such as ones that are half-human and half-bird and half-human and half-lion. Consequently some have seen these as indications of shamanistic beliefs. The earliest known undisputed burial of a shaman dates back to the early Upper Paleolithic era (c. 30,000 BC) in the area of the present-day Czech Republic. However, it was probably more common during the early Upper Paleolithic for religious ceremonies to receive equal and full participation from all members of the band in contrast to the religious traditions of later periods when religious authorities and part-time ritual specialists such as shamans, priests and medicine men were relatively common and integral to religious life. Vincent W. Fallio writes that ancestor cults first emerged in complex Upper Paleolithic societies. Vincent W. Fallio argues that the elites of complex Upper Paleolithic societies (like the elites of many contemporary complex hunter-gatherers such as the Tlingit) may have used special rituals and ancestor worship to solidify control over their societies by convincing their subjects that they possess a link to the spirit world that gives them control over both the earthly realm and access to the spiritual realm. Secret societies may have served a similar function in these complex quasi-theocratic societies by dividing the religious practices of these cultures into the separate spheres of popular religion and elite religion. Religion was often apotropaic; specifically, it involved sympathetic magic. The Venus figurines — which occur abundantly in the Upper Paleolithic archeological record — provide an example of Paleolithic sympathetic magic: people may have used them for ensuring success in hunting and to bring about fertility of the land and women. 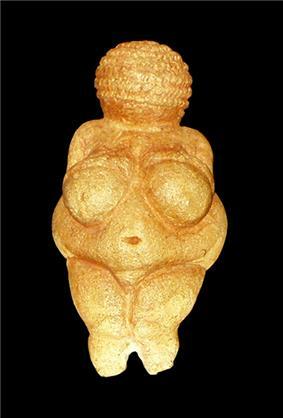 Scholars have sometimes explained the Upper Paleolithic Venus figurines as depictions of an earth goddess similar to Gaia or as representations of a goddess who is the ruler or mother of the animals. James Harrod has described them as representative of female (and male) shamanistic spiritual transformation processes. 300,000 years ago – first (disputed) evidence of intentional burial of the dead. Sites such as Atapuerca in Spain, which has bones of over 32 individuals in a pit within a cave. 130,000 years ago – Earliest undisputed evidence for intentional burial. Neanderthals bury their dead at sites such as Krapina in Croatia. 100,000 years ago – The oldest known ritual burial of modern humans at Qafzeh in Israel: a double burial of what is thought to be a mother and child. The bones have been stained with red ochre. By 100,000 years ago anatomically modern humans migrated to the middle east from Africa. However the fossil record of these humans ends after 100kya, leading scholars to believe that population either died out or returned to Africa. 100,000 to 50,000 years ago – Increased use of red ochre at several Middle Stone Age sites. Red Ochre is thought to have played an important role in ritual. 42,000 years ago – Ritual burial of a man at Lake Mungo in Australia. The body is sprinkled with copious amounts of red ochre - seen as evidence that the Australians had brought along with them religious rituals from Africa. 40,000 years ago – Upper Paleolithic begins in Europe. An abundance of fossil evidence includes elaborate burials of the dead, Venus figurines and cave art. Venus figurines are thought to represent fertility goddesses. 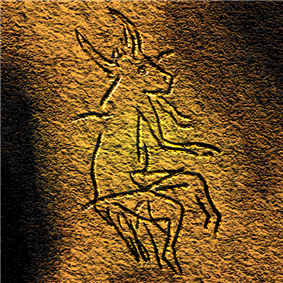 The cave paintings at Chauvet and Lascaux are believed to represent religious thought. 30,000 years ago – Earliest known burial of a shaman. 11,000 years ago – The Neolithic Revolution begins. ^ "The World's Largest Neanderthal Finding Site". Culturenet. Retrieved 7 August 2010. ^ a b c d Karl J. Narr. "Prehistoric religion". Britannica online encyclopedia 2008. Retrieved 2008-03-28. ^ The Prehistory of the Mind: The Cognitive Origins of Art, Religion and Science. Thames & Hudson. 1996. ^ Ryan (1999). "Poesy en Masse". The Strong Eye of Shamanism. ^ a b Tedlock, Barbara. 2005. The Woman in the Shaman's Body: Reclaiming the Feminine in Religion and Medicine. New York: Bantam. ^ Miller, Barbra; Bernard Wood; Andrew Balansky; Julio Mercader; Melissa Panger (2006). Boston Massachusetts: Allyn and Bacon. p. 768. ^ C. Knight, . Power & I. Watts, 1995. The human symbolic revolution: A Darwinian account. Cambridge Archaeological Journal 5(1): 75-114. D. Bruce Dickson, The Dawn of Belief: Religion in the Upper Paleolithic of Southwestern Europe (1990), ISBN 978-0-8165-1336-9.